The Amazon s3 service can be used to store your eProduct deliverables. You will need to create an account for Amazon to gain Access Keys so your 3rd party program can control your images. Select the Sign Up For Amazon S3 button. Enter your email address, select new customer and click the sign in button. Fill out the next few pages with contact information., credit card information and billing information. After successfully signing up, go to Your Account > Access Identifiers. Collect your Access Key ID and Secret Key ID (These will be placed in step 3). This document explains how to upload your files to the Amazon S3 Storage location. Setup your Americommerce AmeriCommerce Online Stores store to work with Amazon S3 storage for eProduct delivery. Enter the Amazon S3 Access Key obtained when you signed up for Amazon S3 service in step 1 above. Enter the Amazon S3 Secret Key obtained when you signed up for Amazon S3 service in step 1 above. Enter the Amazon S3 eProduct Bucket name created with the Amazon AWS Management Console in step 2 above. 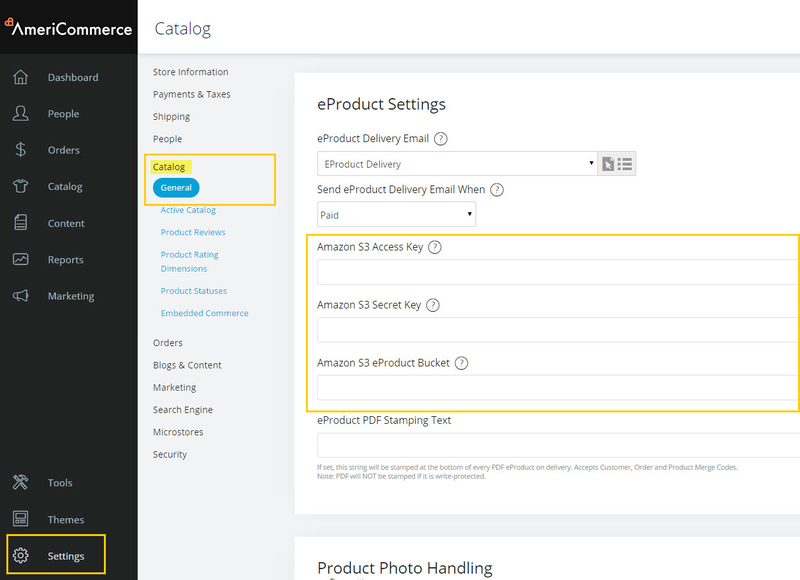 Browse to the product you would like to associate your Amazon S3 file to and select Edit. The eProduct Delivery Link URL using Amazon S3 does not start with the leading / before the folder name. The folder name cannot contain any uppercase characters or underscores, however the file name can. On your csv file generated via a Product Export, find the eProductURL column header. Enter the Amazon file URL. Importing the file will insert the URL for the eProduct.